Most job seekers at least have a sense of their ‘dream position’. That, or a perfect company they would like to work for. But monitoring career pages or LinkedIn in hopes that a posting for the right job will magically appear one day can mean a loooong wait. So what to do? How do you take charge and angle yourself for getting hired into your ideal role with the ideal organization? Enter the letter of interest. With the advice below, you will come to realize that job searching isn’t only about reacting to job openings: forging your own opportunities is also an effective strategy. 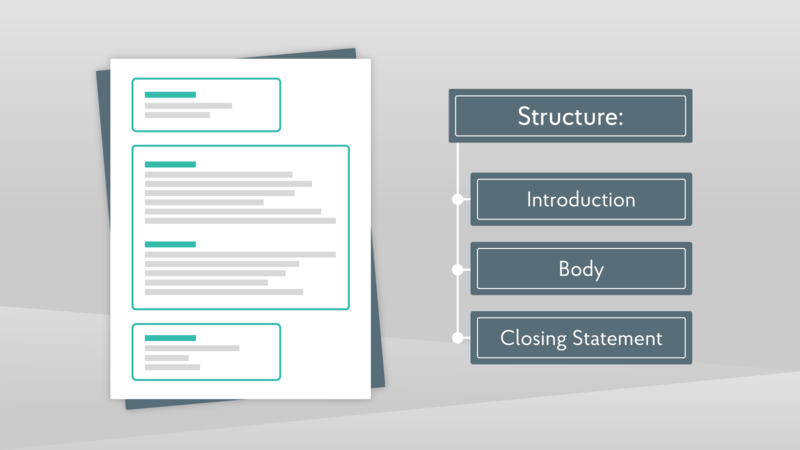 Call it what you want: a letter of interest, expression of interest, prospecting letter, statement of interest…They’re all the talking about the same document. We’ve chosen the ‘letter of interest’ label in this article. A letter of interest is: a letter that expresses your interest in learning more about a particular organization’s employment opportunities and/or working for that organization. It is NOT a cover letter! The difference is that a cover letter is sent along with your resume or CV in response to a specific advertised position. Meanwhile, a letter of interest is not tailored to a specific job posting. It is sent unsolicited to employers to make it known that you are interested in learning about future opportunities. As a job seeker, you’ll often run into the situation of an organization not having any current job openings listed on its website. But their career pages often include a message encouraging you to submit your resume or CV for future consideration. This is precisely when you want to use a letter of interest. Of course, there are plenty of other scenarios when you should make use of a letter of interest. In fact, the point of this article is to help you realize that whenever you find an organization that you really want to work for, you should find a way to get on that organization’s radar using a letter of interest. What Content to Include in a Letter of Interest? Unlike a cover letter, when writing a letter of interest you don’t have an exact job description along with its list of requirements and qualifications to guide you. However, the reason you are writing to the employer in the first place is because you think you are a good fit for their team. So, you need to show them why. Introduce yourself, where/how you heard about the organization, and why you are contacting them (I.e. to inquire about job opportunities). This is where you prove that you have skills and experience that are valuable to the employer. At the same time, you want to be clear about what types of work you are pursuing. You don’t just want any job with the organization, but rather a position that suits your background and interests. Here’s where to include a call to action. You want to make it crystal clear that you are interested in speaking more about the organization and work opportunities. Keep in mind that the employer may not have any openings at the moment, so what you are asking for is essentially an informational interview. Besides a solid structure, there are several elements that make for an effective letter of interest. In other words, if you want your letter to get read and to actually make someone at your target organization excited to get to know you, be sure to follow the principles below. Please, please do not send a letter of interest with a salutation like “To whom it may concern” or “Dear Human Resources Manager”. Put in the extra effort and find an actual person to whom you can address your letter, specifically someone who is in a position to actually help you get what you want. 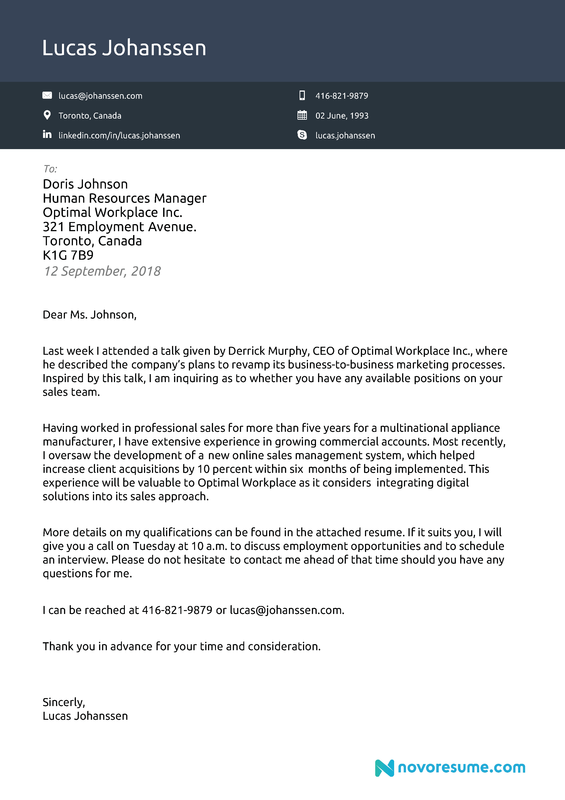 Your letter can be sent to someone in human resources who is responsible for recruiting, or a manager in the department that you see yourself working in. Either way, it’s much easier to persuade someone to give you the time of day by establishing a personal connection. You need to find a way to grab the attention of your recipient. Keep in mind that the person on the other end probably isn’t expecting to hear from you. And that same person is under no obligation to help you get what you want. Your job is to convince your recipient that you are worth his/her time. And a great way to do that is to show off how much you know about the organization and the value you can contribute. This is where in-depth research of your target organization comes in handy. Try to find a project, event, person, etc., that can connect you with the organization in some way. For example, you may have heard a news interview with CEO who mentioned plans to expand operations. Well this is a great entry point for you to articulate how your skills and experience might support those plans. Again, the letter of interest is about persuasion (just like a cover letter). So the more specific you can be about what you have to offer, the better your chances that a recruiter will be able to picture you working for his/her organization. Once you’ve done your research and identified the main attributes that your target organization want in their employees, focus on two or three of these and relate them to your work history or skill set. Qualify your statements as much as possible by pointing to specific examples of your achievements. For example, if you are interested in working for a sales team, highlight an example of how you’ve achieved exceptional sales results in the past. Use metrics to illustrate your point. You may feel the urge to share as much as possible about yourself in your letter of interest so the employer sees you as the total package. Here’s the problem with this strategy: 1) your reader isn’t expecting your email and may be deterred by large amounts of text 2) you risk losing focus on the most important attributes that the employer values 3) you are attaching a resume or CV along with your letter, which already offers a more complete story. Like we said before, keep your letter of interest to a tight three paragraphs, and really home in on two or three points that convey the most relevant contributions you can make. One final thought: Remember that there is a good chance that your letter doesn’t receive an immediate reply. So be ready to follow-up with a phone call to the employer, especially if you say you will in the contents of your letter. Now go find your ideal job or company, and then put your new letter of interest writing skills to the test.